This is a short and basic guide I’ve written up on why and how to accept SmartCash payments for your eCommerce store. Consider it a rough draft with all the content you need to start accepting SmartCash payments for your online store today. I want to give you a brief understanding of why you should integrate SmartCash payments for your business and some of the easiest ways to do it. I’ll also give you some tips about how to market your company to the SmartCash community so that you can start seeing the money come in. Why should I accept SmartCash? Why should you accept SmartCash at your online store? I could say that it’s because SmartCash helps the poor. I could say it’s because it will make the world more free. I could go on about the importance of sound money that is out of the grips of government bureaucrats. I could say you’ll be doing everyone a social service or that SmartCash is the future. It is probably all true. But I don’t think any of that should factor into your business decisions. The simple fact is that accepting SmartCash will help you grow your business by providing a better payment option to customers and helping you reach a bigger audience. It has a number of benefits that make it better than cash or credit cards that include a) SMART is chargeback-proof; b) there are zero to low transaction fees associated with SmartCash; and c) accepting SMART makes business more attractive to certain types of customers among others. At scale this can add up to tens of thousands of dollars per year. SmartCash eliminates this so that you can focus on making sales and growing your company. Since SmartCash is decentralized and the network operates without middlemen, fees are almost non-existent. At the time of this writing, the median transaction fee is 0.00009 USD. What would you do with an extra 3%? I’ve shown dozens of business owners transactions on SmartCash and low fees are always one of the top selling points. I was recently at a store in Brazil and when we showed the owner how to accept SmartCash he immediately set it up and started accepting it on the spot. This has been my experience with most businessmen I meet. One business owner who runs a company estimated the value he might save on fees and chargebacks if he were able to exclusively accept SmartCash in the millions of dollars per year. Even better, SmartCash will enable you to accept micropayments on your site. If you want to sell a digital product for a few cents, for example, you can do it! I regularly transact online with SmartCash for about 1/3 of 1 cent. Anyone who has experienced the process of checking out with SmartCash knows how easy it can be. Unlike traditional purchasing, there’s no need to find your credit card and enter all that information correctly. Just enter your name, shipping info and pay! One or two less steps at checkout means less abandoned carts and more revenue. More importantly, it provides your customers with a safer experience on site since they don’t need to worry about credit card theft. Holding fiat money typically means you’re losing between 1% and 3% a year due to inflation. SmartCash has been on an appreciation trend since its launch. In the past few weeks along at the time of this writing it is up in value over 30%. I’ve personally seen companies accept a SmartCash payment and see it appreciate by 10% or more before they convert it to fiat. That’s extra money in your pockets if you hold your SmartCash. Accepting SmartCash enables merchants to widen their customer base. A growing number of consumers are starting to use SMART to purchase goods and services. Accepting the digital currency could be just the thing to set you apart and get them to choose you. Not only that, but SMART can be used by anyone in the world who has a cell phone or not. That means if they don’t have access to credit cards or banks, or they don’t have a good computer internet connection, these customers can still order from you. Why should I not accept SmartCash? We’ve talked about the good reasons to accept SmartCash, but what are some of the commonly discussed problems with it? SmartCash is market driven and since it is new, its value can swing a good deal. This is great when the price is going up, but it can be challenging if the price goes too low. You might accept it one day and lose 10% on it the next. One of the solutions we’ll discuss in the guide, stratum, allows you to convert your SmartCash payments into BZL at the spot value of the sale so that you’re protected from the volatility. You get the benefits of accepting SmartCash without the downside. Recently exmo.com, smartport.cc, bitprime.co.nz, peer2.cash, changelly.com are support convert SmartCash to fiat. While nobody but you knows your business and your risk tolerance, my general belief is that businesses that accept SmartCash should hold at least some of their earnings in SmartCash. The price is going up on the whole and it could be a wonderful long term investment in your business. There are a loud but dwindling number of people in the cryptocurrency ecosystem who have made it their mission to loudly signal against SmartCash. It is not uncommon for businesses to receive angry online messages from these people and it can be scary as a new business if you aren’t expecting it. While it’s true there are illicit markets that accept SmartCash and other cryptocurrencies, that is also true with any modern currency today. The fact is that SmartCash is used on Shopify stores around the world, to donate to non-profits, as well as helping people get basic necessities in countries experiencing monetary collapse like Venezuela. Just like we don’t blame the US dollar when a criminal uses it, we shouldn’t blame SmartCash or any other cryptocurrency. And given all the benefits of SmartCash, its potential for good (and for growing your business) far outweighs the cons of a few bad actors. Still interested in accepting SmartCash payments? Great! The first step is for you to briefly acquaint yourself with how SmartCash transactions work. This is not, strictly speaking, a mandatory step, but I highly recommend it. Download a wallet from smartcash.cc to your iPhone or Android or Desktop. Try to send/receive some small SMART. Back up your wallet following the instructions and review the security and storage recommendations provided at smartcash.cc. If you already have an existing eCommerce site, you can quickly get started with SmartCash by integrating your store with a SmartCash payment processor. Many ecommerce platforms already have existing integrations, which makes setting up SmartCash payments pain free for people with even the most basic technical knowledge. 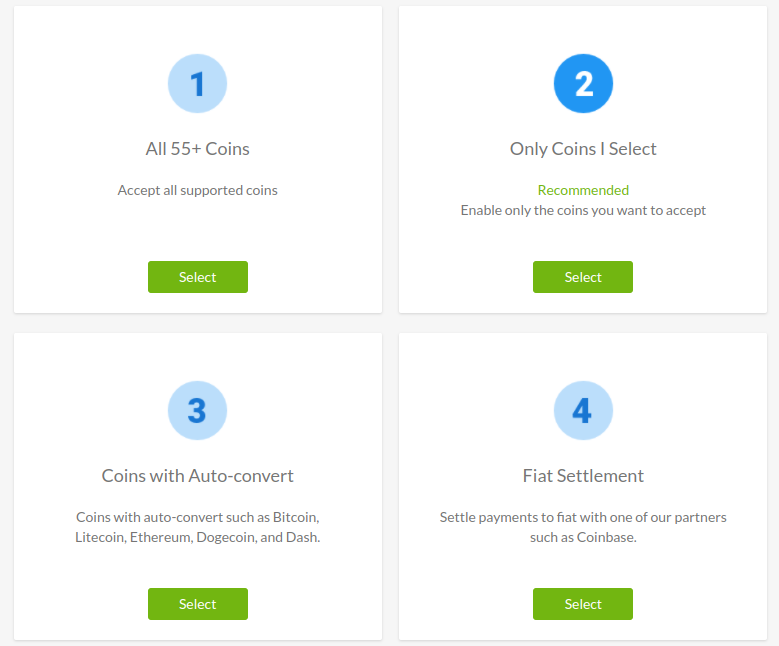 I personally recommend Coinpayments. Here’s a video on setting up Coinpayment. The first step is to create your merchant digital wallet. 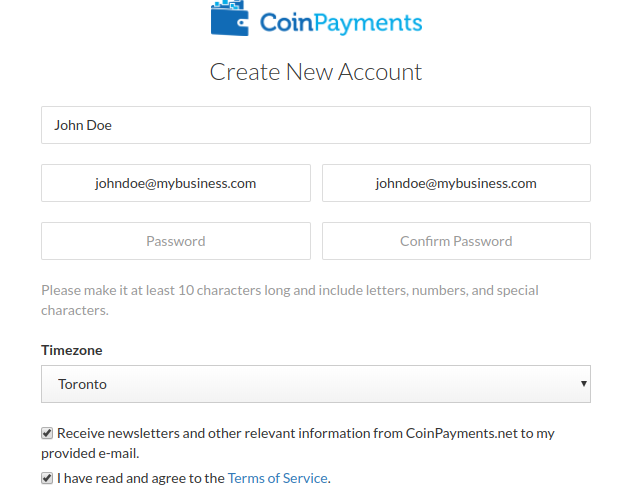 Go to CoinPayments official website, click “Get Started” and create an account by simply filling in your details. 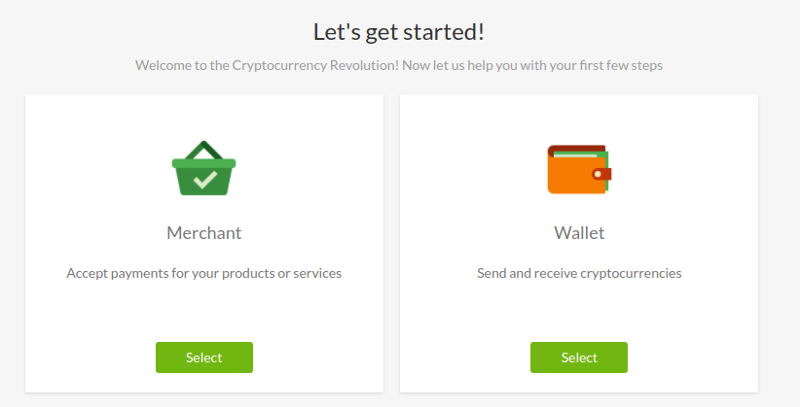 Now that you have an account, the next thing you need to do is create a merchant wallet. 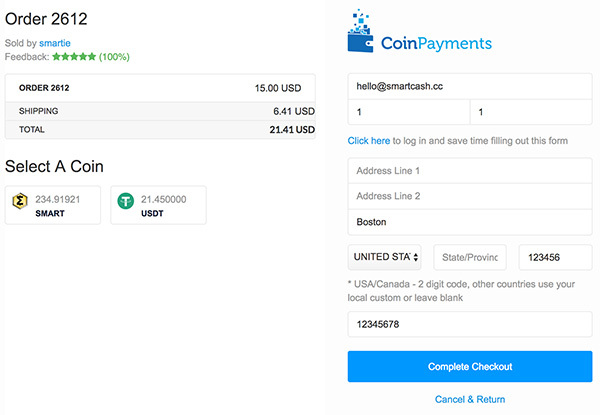 Since Coinpayments offers both consumer and merchant wallets, be sure to select the merchant option. Next, select the types of currency you’d want to accept. Your best bet here is the “recommended” option. You have just set up your merchant digital wallet. Now you need to integrate it to your website. Proceed to your wallet dashboard, click “More” and then “Merchant Tools”. You will see a couple of merchant features such as the ones shown below. The merchant features to choose here would vary depending on the need of your business as well as your technical skills. While a small business may find e-commerce platform plugins easier to use, big ventures with many transactions may find API’s more useful. In our example, we shall use “Shopping Cart Plugin” option. Once you select the “Shopping Cart Plugin” feature, you will see a list of shopping cart plugins. Select a shopping cart plugin of your choice. In this case, we selected WooCommerce. Next, click “Download” and your shopping cart plugin will integrate your payment page through the WordPress.org website. 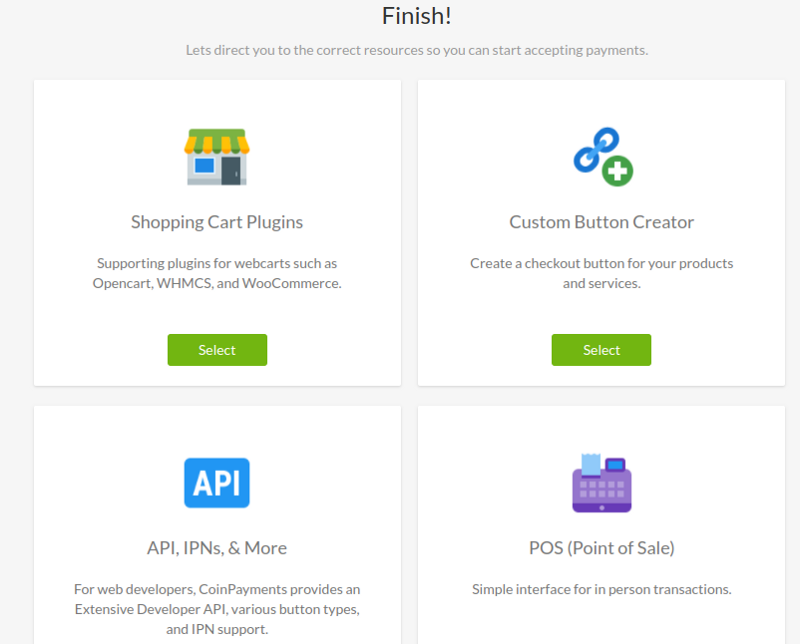 Last but not least, add payment buttons on your website (your homepage and product service page) to let your customers know that you now accept cryptocurrency. Congratulations! Your website is now fully set up to receive SmartCash payments. And receiving SmartCash payments is as easy as receiving an email. Just like an email address, your merchant wallet has a public address through which a customer can send SmartCash. 1/ Create a policies and frequently asked questions page for customers who are interested in using SmartCash on your store or for people who might be interested in learning more. 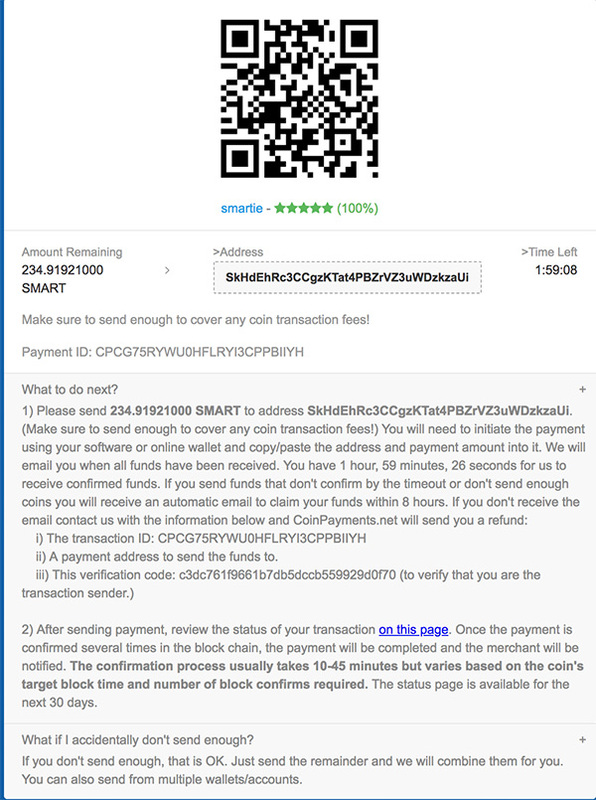 You might also include a link to Smartcash.cc so customers can download their own wallets. 2/ Create a SmartCash “grand opening” discount code for customers and email it it out to your list. Smartie Now Supports SmartCash Checkouts! We’re excited to announce that by popular request to accept SmartCash as a payment option, we have integrated Coinpayments as a checkout option on Smartie.shop. 4/ Share that post on Twitter tagging @scashofficial, @smartcashvn We will make sure your announcement gets spread around the internet. 5/ Share the post in Reddit at r/smartcash This is a great way to get traffic to your announcement and exposure to your products. My personal site often gets hundreds of visits a day from it when I publish articles. 6/ Get in touch with SmartCash at smartcash.cc or find.smartcash.cc. They often do news stories on businesses that decide to adopt SmartCash. That drove a ton of traffic to our site and gave us a nice digital asset to pass around. 7/ Submit your business to be listed on the smartcash.cc site or https://find.smartcash.cc. This is a neat aggregator of merchants. Now that you’ve completed all the basic steps, you’ll want to make sure you stay active in the community, regularly reminding people that you accept SmartCash as a payment option. You might also consider deepening your knowledge of the history and technology behind SmartCash at smartcash.cc where you’ll find everything you need.